Dr. Kellyann is a weight-loss and natural anti-aging specialist and the author of Dr. Kellyann’s Bone Broth Diet. She is featured in the PBS special, 21 Days to a Slimmer, Younger You, and is a regular guest on national television programs. 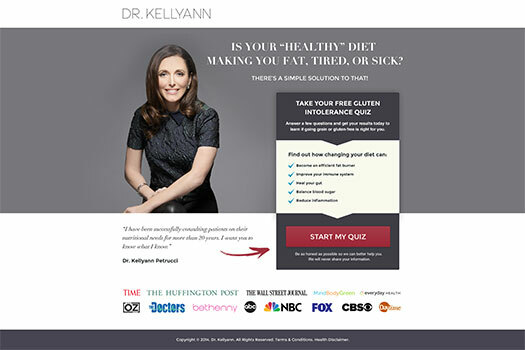 Her website, drkellyann.com, educates consumers about natural approaches to weight loss and wellness. 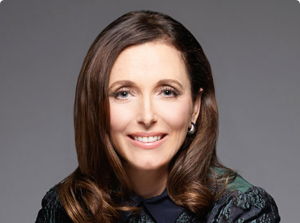 Dr Kellyann’s goal was to grow her email list significantly for the launch of her book, Dr Kellyann’s Bone Broth Diet, to help hit the NY Times best seller list. We started by creating a quiz around Gluten Intolerance. The ads drove people to the quiz where they answered some questions about their health. After they finished the Gluten Intolerance quiz, they opt-ed in with their name and email and were given their results. In our experience, there are three keys to consistently successful quiz campaigns. A good quiz must be highly engaging and have insatiable curiosity to get someone to spend the time to answer the questions, then give their name and email for the results. It must be long enough to give valuable feedback but short enough where people won’t drop out of the funnel. We’ve found 10-12 questions is a good place to start testing. The quiz cannot be leading or biased where people realize you are sending them towards a specific results. Finally, the questions should be straightforward and not require someone to think too hard about a situation or what the right answer is. A successful quiz requires a good traffic source. Website traffic, social media page, affiliates, etc. We choose to use Facebook ads for Dr Kellyann. In order to use Facebook successfully, your ads and quiz must be highly engaging, be Facebook compliant, and have the right mix of targeting and ad creative. We’ve seen the same exact quiz have leads for $3 that with better targeting and ad creative, generated leads for as little as $.30. It’s crucial to use a software that is tested extensively to ensure leads don’t drop out of the sales funnel because of poor user experience or device and compatibility issues. We couldn’t find a solution that effectively solved these problems, so we created LeadQuizzes. Dr Kellyann discovered that using LeadQuizzes was one of the cheapest methods to building one of the most important assets in her business. Using LeadQuizzes and just a single quiz, Dr Kellyann’s created a long-term, sustainable, and scalable source of leads.